Will Eating 1000 Calories a Day Cause Weight Loss? A low-calorie diet definitely induces weight loss, but lowering your calories too much can actually hamper your results. In cases where extreme obesity causes medical complications, a 1,000-calorie diet may be prescribed to initiate quick weight loss. But trying such a diet on your own puts you at risk of developing nutritional deficiencies, stalling your metabolism and losing valuable muscle mass. Reduce your calorie intake to a healthy level for your body, and add exercise to lose weight gradually. Although it's recommended that you create a calorie deficit of 500 to 1,000 calories a day to lose 1 to 2 pounds a week, this rate may be too aggressive for some people. If achieving that rate requires extreme deprivation, it's unlikely you can stick to the plan. Diets that dip below 1,200 calories per day are extremely difficult to adhere to for any length of time, because essentially -- you're starving your body. You may lose weight quickly on a 1,000-calorie diet, but the lost weight is mostly water and lean mass -- not fat. It's nearly impossible for you to get all the vitamins and minerals you need -- even at 1,200 calories per day -- especially if you're a woman of child-bearing age. When you follow a 1,000-calorie plan, any weight you do lose will likely return fairly quickly, once you resume eating a normal meal plan. Your lingering hunger from such a restrictive plan could even cause you to compensate by overeating, which could contribute to gaining the weight back. Low-calorie diets are recommended as a way to lose weight, because they help you create a deficit between the calories you burn and those you take in. When your body uses more energy in the form of calories than it takes in, fat is lost. Trimming caloric intake isn't the only way to create this deficit. Consider upping the amount of energy you use daily through physical activity and daily function -- like fidgeting and walking -- to lose weight. The American College of Sports Medicine advocates 250 minutes per week of moderate-intensity cardiovascular activity to spur significant weight loss. A diet containing between 1,200 and 1,400 calories is still considered low calorie, and will prompt weight loss in most people -- even in sedentary women. Men, because of their larger size and subsequently greater energy needs, might require approximately 1,800 calories per day to lose weight safely and to keep it off. Choosing quality foods that offer optimal nutrition and satiation when you're trying to drop pounds is critical. Fill your plate with lots of nutrient-dense but calorie-light, green, watery vegetables. Lean protein helps you feel full, so choose skinless chicken or turkey, lean beef, fish or eggs at most meals. Also include whole grains because they contain fiber -- which takes longer to digest -- and avoid refined grains such as white bread. Processed foods manage to pack a lot of calories into small servings, so avoid them. 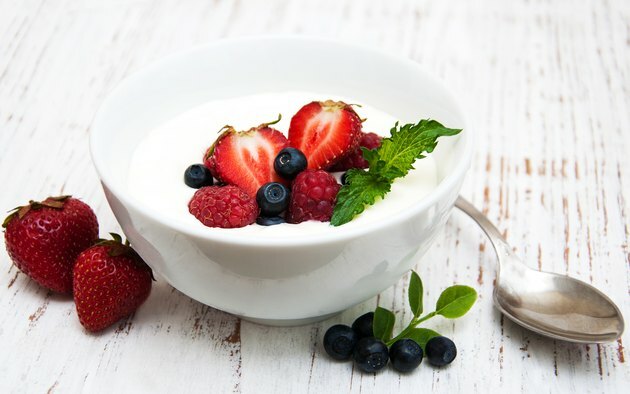 If you need a low-calorie snack -- opt for a piece of fresh fruit or low-fat, plain yogurt with berries. Sometimes, people on a 1,200-calorie-per-day diet don't lose weight and think they need to trim their intake more to get results. Chances are, they're underestimating their daily caloric intake. They may simply forget about a snack they ate, get so hungry that they then eat a larger serving than they had planned or they don't measure and weigh their food to make sure they're on track. If you've hit a weight loss plateau on a 1,200-calorie diet, make sure you weigh your portions, and try writing down everything you eat so that you don't forget a food item or two. When your weight seriously endangers your health or you're prepping for an intense obesity treatment, such as bariatric surgery, your doctor may prescribe a very low-calorie diet of 800 calories or a low-calorie diet of 1,000 calories a day. This calorie limit is usually prescribed to women, as it's considered too low for most men, who are restricted to 1,200 to 1,600 calories a day on medically prescribed low-calorie plans. In such cases, the 1,000-calorie diet is designed by a dietitian and usually consists of small portions of whole foods, but it may include meal replacements to help you get all the requisite vitamins, minerals and fiber you need. Go Ask Alice: Ideal Caloric Intake? Centers for Disease Control and Prevention: Losing Weight; What Is Healthy Weight Loss? How Many Calories Should I Eat a Day to Lose 5 Lbs a Week?